Any seventh or eighth grade student wishing to participate on any athletic team will need to have a current physical on file with the school nurse, a signed participation agreement, & a concussion information sheet on file with the coach. Flag Football (this is replacing tackle football) There will be a 7th grade team and an 8th grade team. 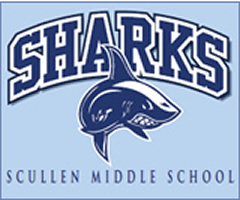 There will be referees and Scullen will play all other 204 middle schools two times throughout the season.